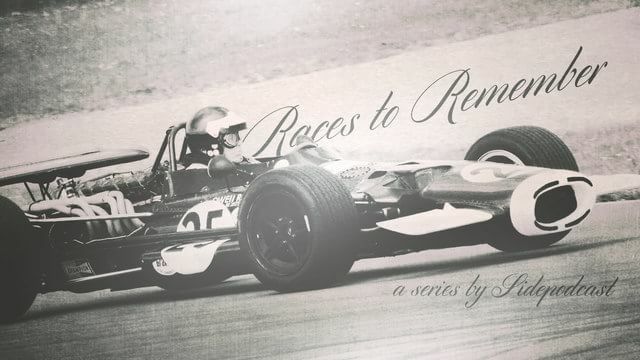 Welcome to Sidepodcast’s latest mini series, Races to Remember – a look back at those Grand Prix weekends that provided memorable action or record-breaking results. We’ve looked at close finishes in Italy, and high retirement numbers in Monaco, but today it’s time to look at something a little bit different. Our third of seven short shows focuses on a race from 1961, the Dutch Grand Prix. Held at the Zandvoort track in the Netherlands, the 1961 Dutch Grand Prix was the second round of the season. It followed the opening race in Monaco, which was won by Stirling Moss in the Lotus putting the Brit in the lead of the championship ahead of two Americans – Richie Ginther and Phil Hill. Lotus were still dealing with the repercussions of an accident in Monaco, which saw Innes Ireland crash out during practice and break his leg. His replacement was Trevor Taylor, racing in his only Grand Prix that year. The Zandvoort circuit was in its original configuration, with just over 4 kilometres of weaving curves culminating in a lengthy straight to the finish line. Phil Hill secured pole position in the Ferrari, with his fellow Scuderia teammates Wolfgang Von Trips and Richie Ginther behind. Moss was fourth for Lotus, with Graham Hill fifth in the BRM. Actually, as races go, it wasn’t a very good one. Von Trips took the lead off the line and never looked back. He led every single lap, although it was a close fight with teammate Hill for second – Phil finished less than a second behind the leading Ferrari. Hill had his own fight to win, with Jim Clark bursting forward from 11th on the grid to fight for second place. The pair did tussle for much of the race, and second place changed hands occasionally, but Hill got the position when it counted. Graham Hill was in contention with the front runners early on but dropped back through the field, eventually finishing eighth and out of the points. Stirling Moss provided some of the entertainment, doing battle with Graham and also with Richie Ginther. There was a good fight between Moss and Ginther that ended with Moss snatching fourth on the final lap, after Ginther ran wide around a corner. The win put Von Trips on equal points with Stirling Moss, but neither were to take the title. Both secured one more win over the course of the season, but Moss’s four retirements dropped him down to third. Von Trips didn’t finish two races, leaving Phil Hill to grab the title thanks to his consistent podium finishes and two race victories. The Dutch Grand Prix, then, was a relatively tame race, and you might be wondering what is record breaking about it. The GP is one of just three that have all the entered cars finishing the race, with no retirements. From the 1960s all the way until the new millennium, it held the record of the only race to have achieved such a result. However, along came the 2005 Italian Grand Prix and the 2011 European Grand Prix to share the crown. It’s clearly more of a feat for that to happen in the 1960s, given the level of reliability modern F1 has achieved, but sharing a record with three other races makes it slightly less special. What we’re focusing on here is that the 1961 Dutch Grand Prix is the only F1 championship race that featured no pit stops. No tyre changes, no refuelling, no repairs. 75 laps of out and out racing, with all drivers classified as finishers with no pit stops completed. It will be hard for that record to be beaten, considering current F1 regulations mandate at least one pit stop per race. With the combination of no pit stops and no retirements, the 1961 race is certainly unique… if not hugely exciting. That’s all for this episode of Races to Remember, thanks as always for listening. What do you think of racing without pit stops? Let me know in the comments on sidepodcast.com, or email me christine@sidepodcast.com. I’ll be back tomorrow with the fourth episode of this mini series, so I hope you’ll join me then.